A world time with the world. 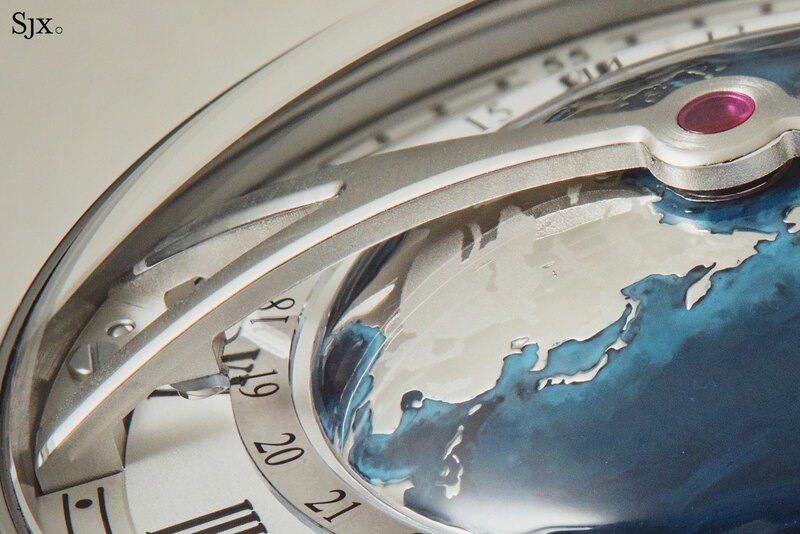 A world map is often a crucial part of the iconography of the world time watch, and Arnold & Son has taken that quite literally with the Globetrotter. 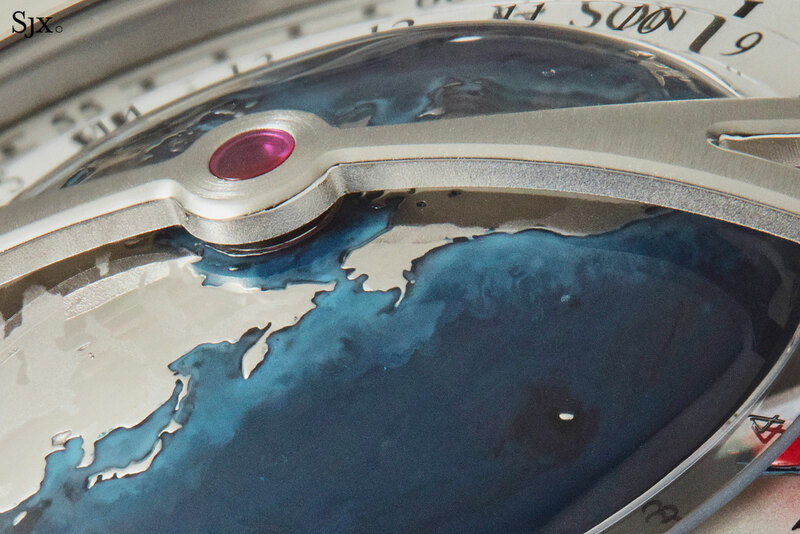 It’s a watch that maximises the aesthetic potential of the complication, featuring a huge, hemispherical depiction of the Earth as seen from above the North Pole. The predominant form of world time watch is Louis Cottier’s invention – personified by Patek Philippe’s offerings – that displays the hours in all of the world’s 24 time zones via a rotating 24-hour scale and cities disc. The Globetrotter, on the other hand, replaces the cities disc with a rotating central globe to indicate the various time zones. It’s held by a large, arched bridge spanning the entire diameter of the dial that’s topped by a jewel at the central pivot and reminiscent of MB&F’s Legacy Machines. While visually striking – it really does make a dramatic statement on the wrist – the downside of the globular world time that unless one’s a geography whiz, the locations relative to time zones are an approximation rather than certainty. 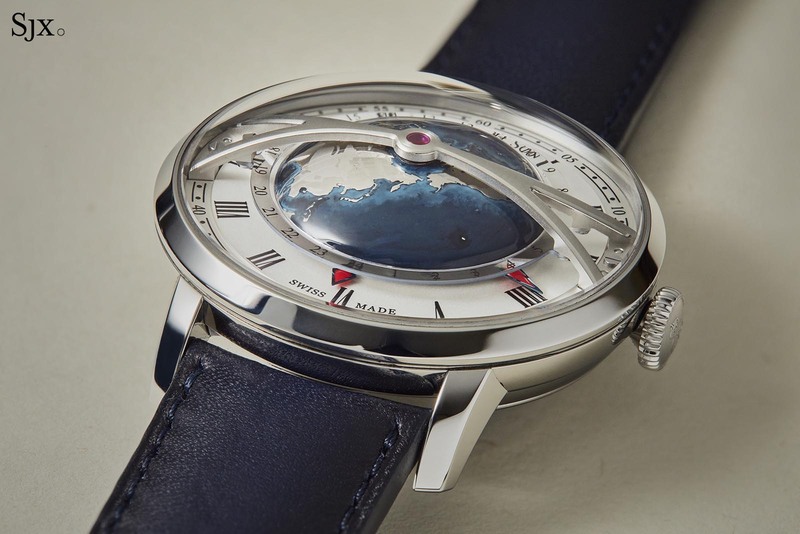 Local time is indicated by two blued steel arrows filled with red lacquer that extend from the base of the hemisphere, so they obscure neither the globe nor the 24-hour scale. And the Globetrotter is a true world time watch, meaning the hour hand is independently adjustable in one-hour steps via the three-position crown: for hand-winding, setting only the hour hand, and setting both hands. The entire globe rotates once every 24 hours, allowing the time anywhere in the Northern Hemisphere to be read against the concentric 24-hour scale. A transparent sapphire ring sits directly above the 24-ring, fixed to the same bridge that holds the hemisphere. Half the sapphire ring has been tinted with a darker, metallic finish, so functions as a day and night indicator, with the darkened half indicating night-time on that side of the world. So while the time zones in terms of geography are blurry, the rest of the watch is eminently functional and easy to use. 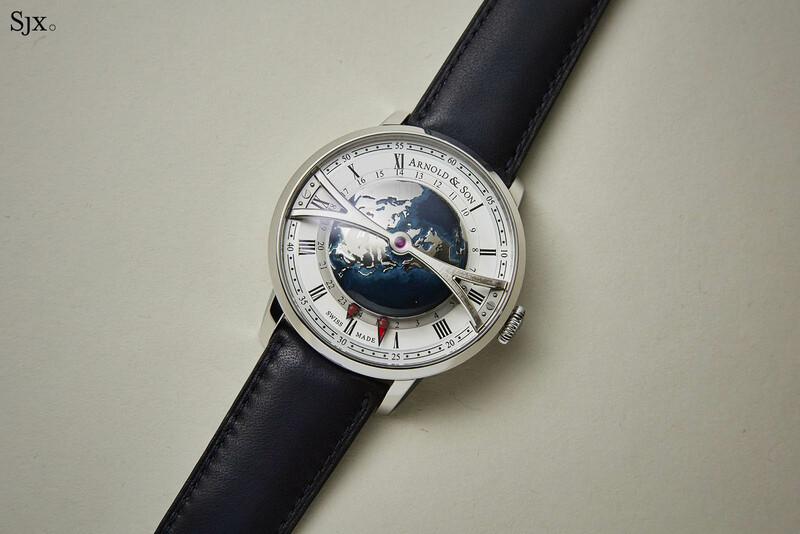 Though the version pictured show the Northern Hemisphere, the Globetrotter is also available with the Southern Hemisphere on the dial. Though the Globetrotter isn’t the first watch with a three-dimensional globe on the dial, Seiko and Magellan have done similar, but it’s the only one we know of that combines the globe with a world time function, though the Greubel Forsey GMT does similar, albeit with a tiny globe. Because the watch itself is large, measuring 45mm in diameter with a dramatically domed crystal that’s 17.23mm at its highest point, the globe makes this one of the largest, perhaps the largest, rotating world time display in a wristwatch. Made of brass that has been engraved, plated and lacquered, the globe itself is depicted in great detail, with nuanced colours to illustrate the varying depths of the oceans and the mountains on the continents. The mountainous areas of the continents are sandblasted, giving them a frosted surface that stands in contrast with the polished surface of lower-lying areas. The oceans are lacquered by hand in different hues of blue, getting darker further away from the continents as the waters deepen. Consequently, the watch has a cool, blue palette that is restrained, which helps make it more wearable by muting its colours to compensate for the large size. The Globetrotter is powered by the in-house calibre A&S6022. It’s a 29 jewel automatic that runs at 4Hz and has a power reserve of 45 hours. 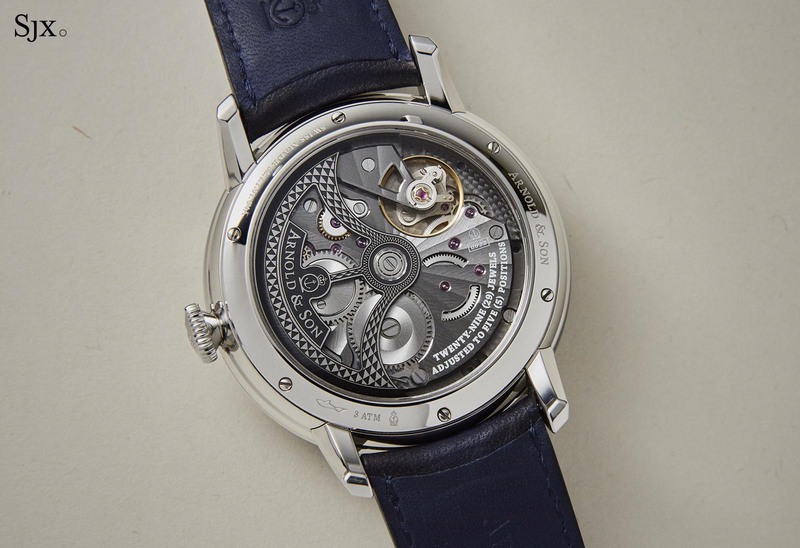 Like most other Arnold & Son movements, it’s built by sister company La Joux-Perret; both are owned by Citizen of Japan. With the bridges finished in dark grey ruthenium and the rotor coated in amorphous diamond-like carbon (ADLC), the movement is monochromatic but neatly dressed up with mechanically applied finishing, as is typical for watches in this price segment. The rotor is decorated with a two-tone hobnail finish while the bridges feature radial Côtes de Genève and machine-cut bevelling. It is clearly and tidily done, with even the pallet fork bridge under the balance wheel having a brushed finish. 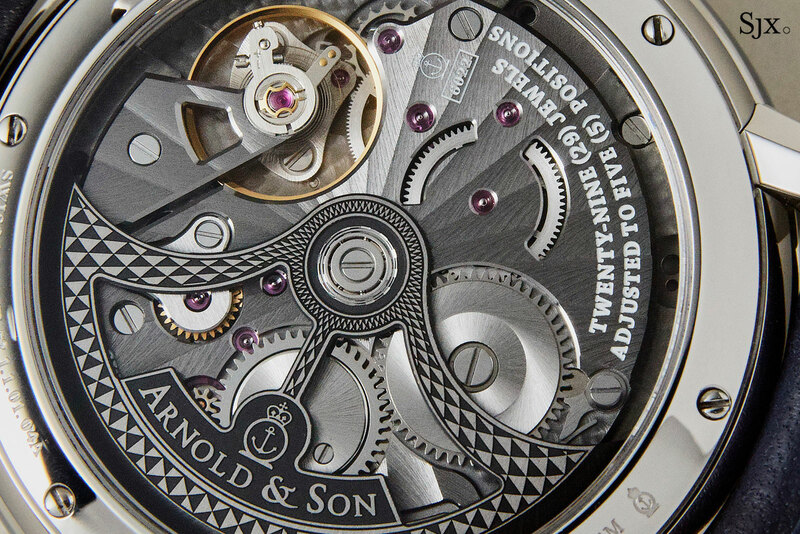 Only the engraved lettering filled with white lacquer feels out of place, being done in a heavy font that doesn’t complement the more elegant typography of the Arnold & Son logo. Overall the Globetrotter is a different take on the world time that is well executed without being excessively expensive. 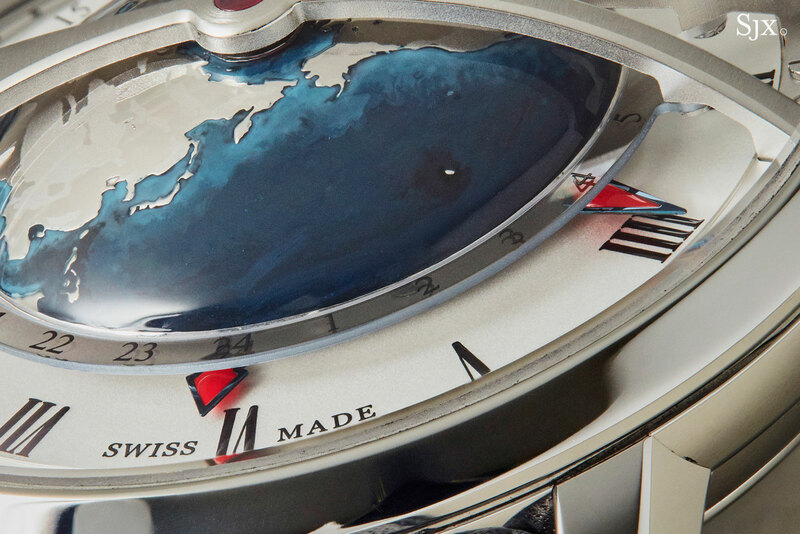 Though it falls short on practicality due to the legibility of the world map, the unusual aesthetic and presence on the wrist makes up for it. 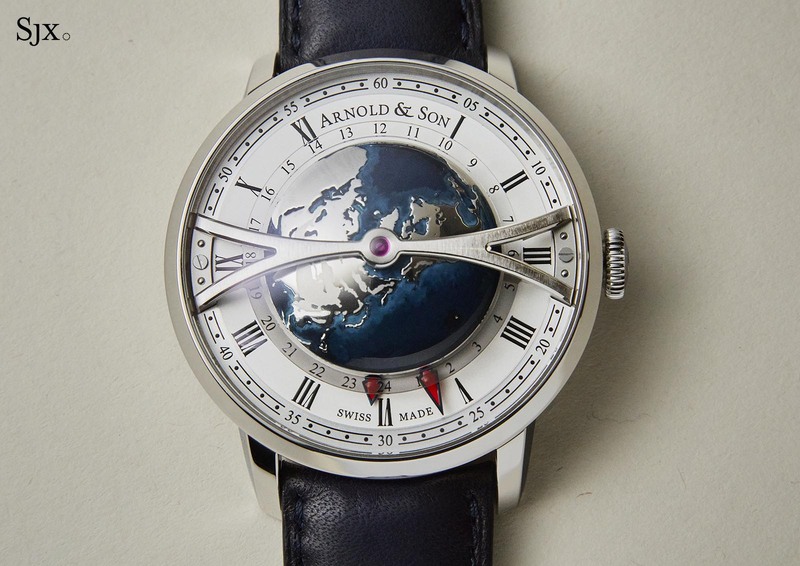 The Arnold & Son Globetrotter (ref. 1WTAS.S01A.D137S) is priced at US$16,995. It can be delivered with the Southern Hemisphere on the globe with no change in price. 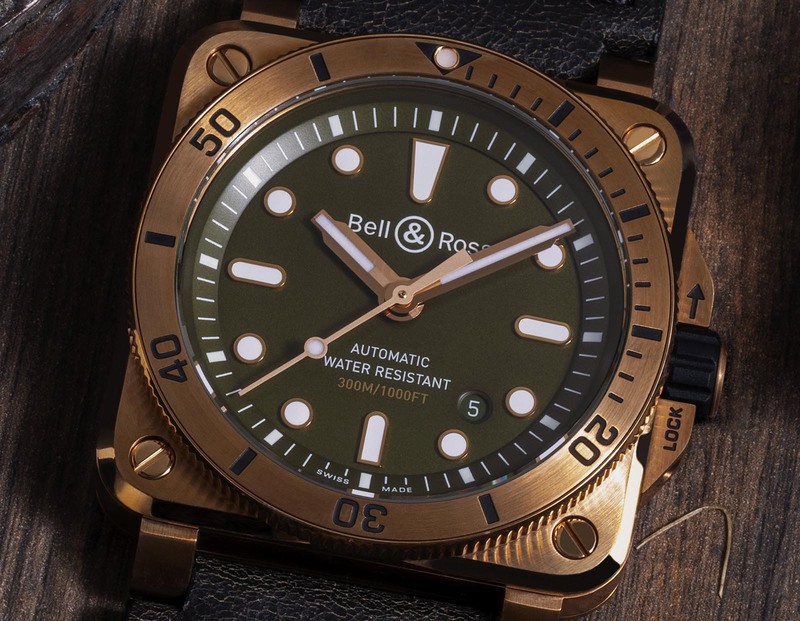 Two years ago, Bell & Ross introduced the BR 03-92 Diver, which more recently made its debut in a bronze case. 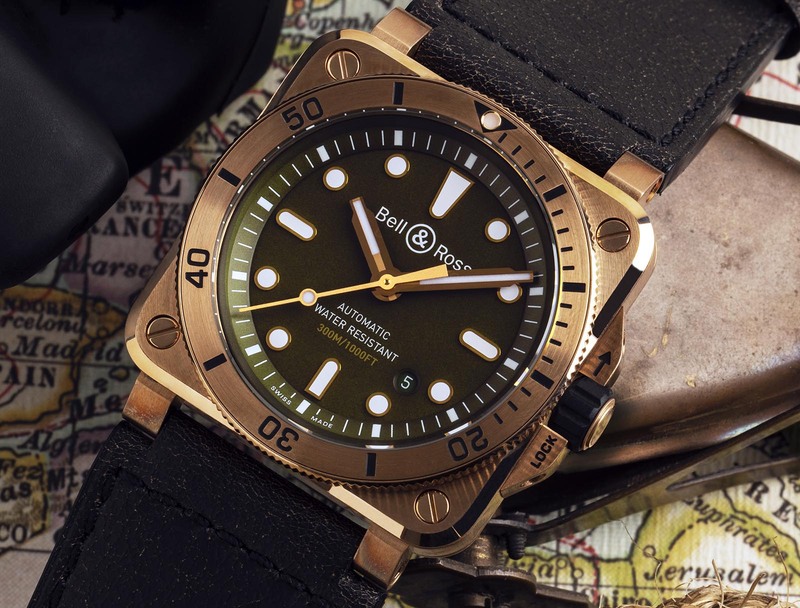 Now to mark 15 years with Singapore watch retailer Cortina, B&R has unveiled the Demiurgus, a limited edition diver that combines the bronze case with a khaki green dial, which will be available only online. Greek for “creator”, the Demiurgus diver has a 42mm case made in satin-polished CuSn8 or phosphor bronze, an alloy that contains 92% copper and 8% tin. In contrast to aluminum-based bronze alloys, like that used by Tudor for instance, CuSn8 is reddish in colour and develops verdigris, or a greenish patina. The military green dial sticks to a tried and true dive watch template, with applied dot indices and elongated quarter markers, which are gold-plated and filled with Super-Luminova. Dial aside, the Cortina edition has the same specs as the stock model. That means a case that measures 42mm by 42mm. But unlike the standard BR 03 models, the diver is rated to 300m and adheres to the ISO 6425 standard for dive watches. The water-resistance is achieved in part by fortifying the crystal and back, making it thicker than the standard model. The sapphire crystal is 2.85mm thick, compared to 1.8mm on the ordinary BR 03-92, while the case back is 2.8mm. It features a unidirectional bezel that extends slightly over the edge of the square case middle, leaving ample teeth for grip. Another element unique to the diver case are the crown guards and a rubber-coated bayonet lock crown. The movement inside is the BR-CAL.302, which is a Sellita SW300. It sits inside a soft iron cage that offers protection from magnetic fields of up to 80,000 A/m, which is the same level of magnetism resistance as a Rolex Milgauss (unsurprising since the Faraday cage is the same). 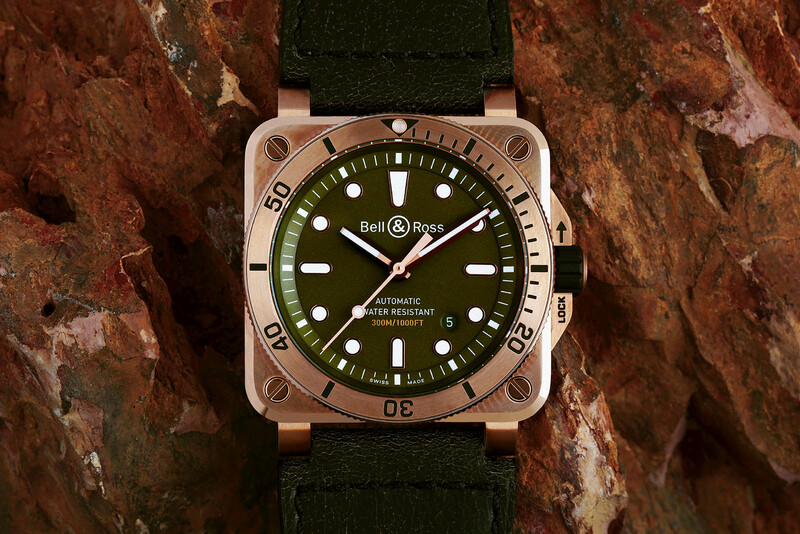 The BR 03-92 Bronze Diver “Demiurgus” Cortina edition (ref. BR0392-D-GN-BR/SCA) is priced at S$5794.39, or about US$4200. It is available exclusively on cortinawatch.online, however, customers are able to try on the watch in person and make purchases via iPads in Cortina stores.